What Makes Up A Cartridge? If you’re a brand-new handgunner or if you’re a seasoned veteran, sometimes it’s good to take a step back and look at some data on the cartridges we shoot. Maybe we’re thinking of expanding our gun collection but are not sure which way to go in terms of caliber, or maybe we’re just curious as to where the .380 ACP came from, for example. Then again, maybe we’re reloaders and wonder if that new caliber we have in mind is easy to reload. A cartridge comparison guide is a good place to start. One thing’s for sure – we who shoot handguns have never had it so good in terms of the variety of cartridges out there. Whether you are a hunter who prefers rimmed cartridges in either a single- or a double-action revolver or a shooter who uses a semiauto for various purposes, there is at least one cartridge that will do the job at hand. The list of cartridges designed for handguns is long, but we will look at the top 11 choices. How do I know these are the top choices? Sales. These are the best-selling handgun cartridges in the U.S. in terms of numbers sold. We’ll look at where they came from, average ballistics and typical uses for each. Handgun cartridges (and rifle, too, for that matter) are named in basically one of two ways. Remember, I said “basically” – there are always exceptions. What do these mean? Let’s take a look. Caliber is given in either millimeters or decimals. This has to do mostly with where the cartridge originated. If it’s from Europe, it will be a metric designation although there are a few metric cartridges developed in the U.S. Rounds developed in England or the U.S. will generally use a decimal designator. Both types of names simply indicate the bullet diameter, more or less. The 9mm, for example, shoots a 9mm bullet, roughly .355 inch in diameter. The 10mm and the .40 S&W both shoot the same bullet – .401 inch diameter. (A quick clarification – when I use the term “round”, that means cartridge.I thought I’d better mention that up front). The .38 Special and the 357 Magnum cartridges both use a .357-inch diameter bullet but the .357 Magnum round will not fit in a .38 Special’s cylinder – it is too long, on purpose. 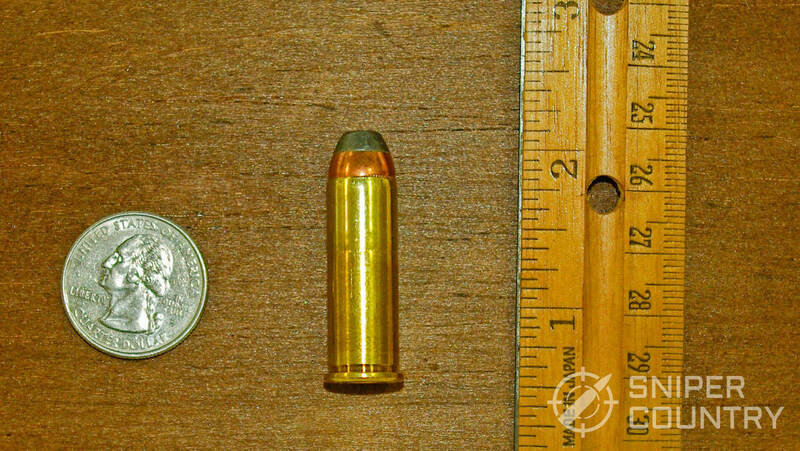 The .38 case is 1.155 in. 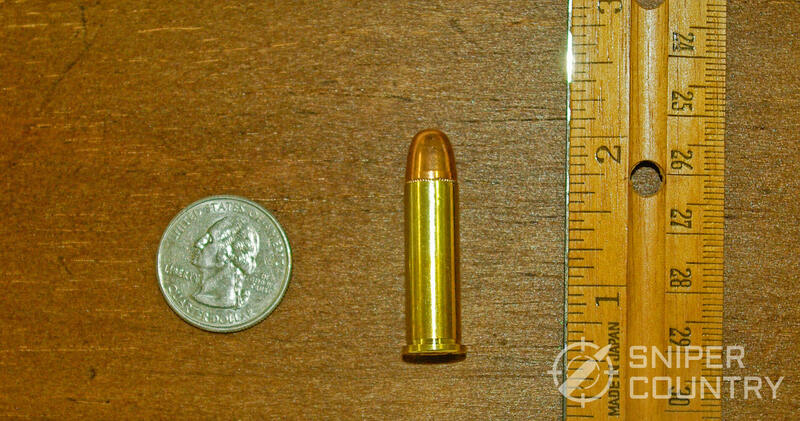 long with the .357 case measuring at 1.285 in., a difference of .17 in. The .44 Special and Magnum cases are almost identical to their .38 counterparts in length (1.152 vs. 1.280 in). The older .38 Special is loaded to a much lower pressure than the .357 Magnum, as are the respective .44 rounds.. The more powerful magnum rounds would, most likely, blow up an older .38 or .44 Special revolver. Therefore, we must be careful to not mix the two. Some very old .38 Special revolvers’ chambers are worn enough to allow a .357 Magnum cartridge to be inserted but I wouldn’t want to be the one to fire it. Why .38 If It Isn’t? So, once you’re familiar with the system you will know that the .38 Special and the .357 Magnum shoot the same bullet, diameter .357 inch. Why call it a .38, you might ask. The .38 Special pre-dates the .357 by a third of a century. There had been several different .38 caliber rounds in use up to the year (1898) that the .38 Special was introduced. The .38 Special round was derived from the .38 Short Colt which in turn was developed to shoot in .36-caliber converted cap and ball revolvers. It was called “.38” even though it fired a .357-caliber bullet. “.38” referred to the diameter of the loaded case. Consequently, the .38 and .357 both use .357-caliber bullets. Special/Magnum Reloaders – Take Note: If you are a reloader and reload both the special and the magnum version of either of these .38/.357 cartridges or their .44 counterparts, please do NOT put magnum-level loads in the shorter cases. Use only magnum cases for magnum loads. It’s OK to download the magnum loads a bit, but still use the longer cases. This is advice gained from personal experience of the not-so-pleasant type. “ACP” stands for Automatic Colt Pistol. John M. Browning designed both the .380 and the .45 ACP rounds – more on this below. “S&W” means Smith and Wesson, the company that developed the .40 cartridge. Others had a hand in it but the headstamp on a .40 S&W case says exactly that, 40 S&W. The .45 Colt is called that because it was designed by Colt and introduced in 1872. It was destined to be fired in their 1873 Peacemaker single-action revolvers. It was the Army’s official cartridge for 14 years. Some sources will call it the .45 Long Colt, but technically it is the .45 Colt, The “Long” part was added by Army quartermasters in order to distinguish it from the shorter .45 cartridges of the day but we call it the .45 Colt today. A modern cartridge is assigned to one of two main groups: rimfire and centerfire. Here’s a quick definition of the two, with the components explained below. Rimfire cartridges have their priming compound in the rim of the case. The .22 is an example of this. In the 19th century, many large-caliber rounds were rimfires. Today, only a very few cartridges are rim-primed. Centerfire cartridges use a separate, round primer to ignite the powder that is located in the center of the case head. Now that we know the difference, let’s take a centerfire cartridge apart and define each part. (Rimfire cartridges use the same basic components minus the primer but we’ll look at centerfire rounds). Cartridge Case: the brass (or aluminum) casing designed to hold the powder charge, bullet and primer (centerfire). This case is round with a flat “head” (the end towards the breech) and has either a rim (revolver cartridges) or is rimless (semiauto cartridges) attached to the head. The round percussive piece that is struck by the gun’s hammer or striker that ignites the powder. priming compound, the chemical “igniter” that produces the spark that ignites the powder in the case. There are two main types of primers: Boxer and Berdan. Boxer primers fire through one centralized hole in the bottom of the case and contain the anvil against which the priming compound is crushed. These are by far the more popular of the two for modern handgun and rifle cartridges. Cases that are Boxer-primed are easily reloaded. Berdan primers are built so as to fire through two holes in the case’s head, which contains the anvil against which the priming compound is crushed. This convex anvil is in the location of the hole that a Boxer-primed case contains. Berdan-primed brass is very rare in modern arms – it is popular in Europe, mostly with older military surplus rifles and handguns. It is not easy to reload Berdan-primed cases and is generally not worth the trouble. One should at least know the difference between Boxer and Berdan primers because most Berdan priming compound is corrosive and must be cleaned out after the gun is fired. How to identify the two: Look into an empty cartridge case. If you see one hole at the bottom, it is Boxer-primed. Two smaller holes on either side of the center tells you it is Berdan primed. Unless you are loading for a very rare, hard-to-find Berdan-primed cartridge, you usually will just throw the empties away. Berdan-primed cases are not worth the trouble, trust me. There are two basic sizes of primers, large and small, and two different power levels, standard and magnum. This is true for both pistol and rifle primers. The propellant that is ignited by the primer and burns which in turn pushes the bullet down the barrel and out the muzzle. There are many different types of powders, each of which performs one or more specific tasks well. Slower-burning powders are used in magnum cartridges, typically. These powders usually require a larger amount loaded into the case and burn at a slower rate. This is what is needed to move a large bullet down a long magnum revolver’s barrel at maximum velocity. On the other end of the spectrum, there are fast-burning powders that excel at lighter target loads or rounds to be used in semiautos with their shorter barrels. Powder selection could be an article in and unto itself – it involves many details and variables. The projectile which is shot out the gun’s muzzle when the primer ignites the powder. Notice that the bullet is ONLY the projectile…do not call the entire cartridge a “bullet.” It is called a cartridge for good reason. There are thousands of bullets available, but for our handgun-related purposes here we discuss cast lead bullets or jacketed bullets. Each has its uses. Suffice it to say that, in general, cast bullets are used in target loads at lower velocities or in magnum-level hunting loads in both revolvers and semiautos. Jacketed bullets (jacketed hollow point, JHP or jacketed soft point, JSP) tend to be used in self defense or hunting loads as their reason for being is to expand to a greater diameter after striking the target in order to increase incapacitation of that target. As with cast bullets, jacketed bullets may be fired in either revolvers or semiautos. (One caveat: some manufacturers of semiauto pistols warn against shooting non-jacketed bullets in their guns due to chamber dimensions and rifling type). 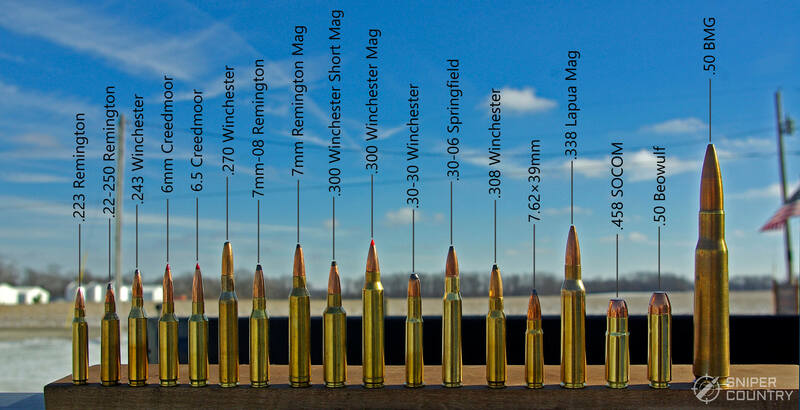 BONUS: This image is from our Rifle Caliber Guide. I highly recommend reading it, if you want to learn more about rifle cartridges. OK…we know now what the different numbers and terms mean…how about looking at each cartridge in some detail? Some of their development stories are interesting. Also remember that R&D in terms of new cartridges never stops…who knows…in five years a guide like this one might contain several new rounds! Please keep in mind that it is very difficult to list just one representative bullet weight, velocity, energy, etc. for each cartridge. There are many variables that can affect these numbers: barrel length, bullet weight, type of load (defensive or target), type of gun, powder charge…I have listed what are, to the best of my knowledge and experience, truly cartridges representative for each caliber. I looked through several books and online ballistics sources to arrive at these selections. I therefore tried to determine a “representative” load for each caliber. Just remember, as those who write in the gun forums like to say, your mileage may vary. Special Note to Reloaders…I have included,as part of the data description of each cartridge what I call a “Reloadability Factor” – this will be scale from 1 – 5 with 1 being very difficult or expensive to reload and 5 being the easiest. If you need more information about reloading, here is an article that may help. Let’s start by taking a look at rimfire cartridges. 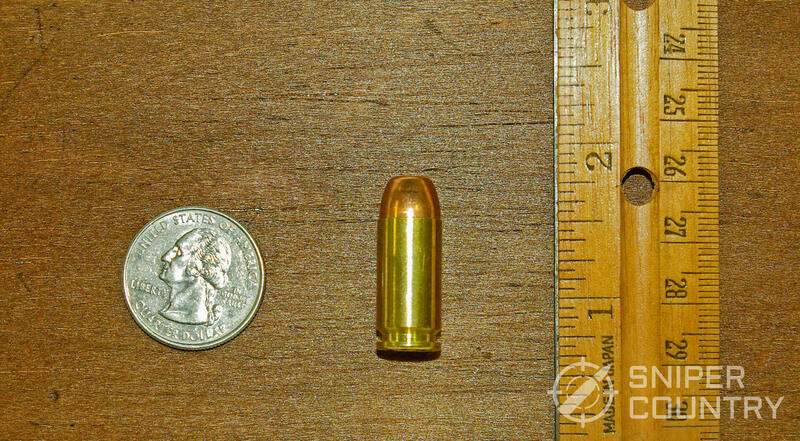 Short: A .421-inch-long case firing a 29- or 30-grain bullet. This was America’s first metallic-cased round. Long: A .613-inch-long case firing the same bullet as the Short. Long Rifle: The same case as the .22 Long firing a nominal 40-grain bullet. The Long is not seen today for the most part although Shorts are available. Some like to hunt small game with Shorts due to their lack of noise. They will not feed in most semiauto pistols or rifles. We will look in some detail at the most popular rimfire going, the .22 Long Rifle. The .22 Long Rifle (.22 LR) is, by far, the most popular cartridge sold in the world today. Sales figures put yearly production at between two and two and a half billion rounds a year. The hefty production reinforces its popularity. This is the cartridge that most of us grew up shooting, and most shooters still own at least one .22 LR handgun. The round is used for recreation, hunting, informal target shooting (“plinking”), competition, training and to introduce new shooters to the sport. Its relative lack of recoil and low noise level make it ideal for these uses and more. The .22 LR is the only round discussed here that uses a heeled bullet. All other bullets in cartridges on our list fit inside the cartridge case. With the .22 LR, only a small portion of the bullet base, the “heel”, fits inside the case. The remainder of the bullet is bore diameter and rests outside the case. A special lubrication is used that does not rub off. Bullets are made with a solid nose, or a type of hollowpoint. There are some special hunting and defense loads for the .22 LR that yield hyper velocities. Bullet weights as low as 30-32 grains can be pushed as high as 1500-1800 fps or higher in some cases. Nominal figures for the .22 LR are given below. The cartridge sells so well because, in addition to its other traits listed above, it is one of the most versatile rounds for handguns out there. It’s no wonder that rimfire round production is so high. Unfortunately, rimfire cartridges cannot be easily reloaded. Well…they can but it takes some very specialized equipment. Most reloaders choose to not jump through those hoops so they buy their .22s at the store. Hence the “0” for the Reloadability Factor. For more on the history of the .22 Long Rifle and some handgun suggestions, read this article. This Load: The load described here is the typical representative bullet weight loading of 40 grains. There are more .22LR and .22 Magnum loads out there than you could shoot in a month of Sundays, so I mention the standard 40-grain loading at around 1100 fps. With .22LR, you can get faster (hyper-velocity) or slower (subsonic) loads for specific purposes but if you want a plain-jane plinking load, here you go. A shot from a .380 helped start World War I. Serbian nationalist Gavrilo Princip used a .380 to assassinate Archduke Franz Ferdinand of the Austro-Hungarian Empire. One thing led to another after the shooting which ultimately started WWI. Introduced in 1908 by Colt for use in its Colt Model 1908 pocket hammerless semi-automatic, the .380 ACP round has been a popular self-defense cartridge ever since. Another popular name for it is the 9mm Kurz (“short”, if you’re not up on your German). 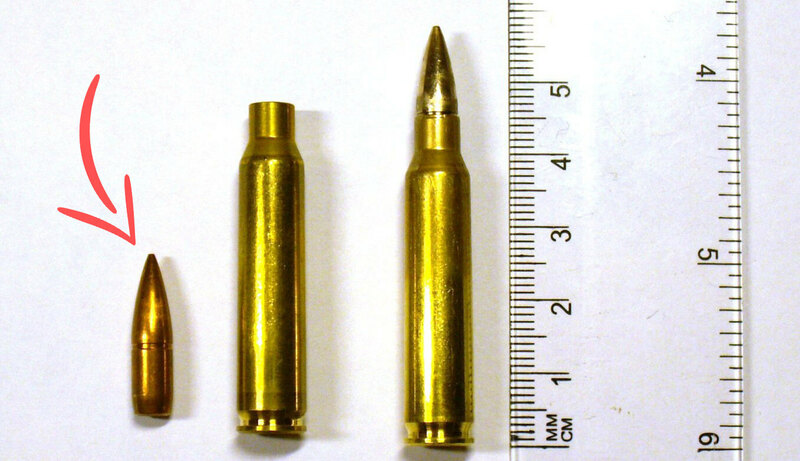 It uses the same bullet diameter of the 9mm – .355 – but .380 bullets are lighter (95-105 grains). A locked-breech pistol is not normally required for the .380 due to its lower pressures but some of the better examples of .380 pistols utilize that build feature. At one time, the .380 was considered a fairly powerful cartridge. It replaced the .32 Auto by and large and today is the premier pocket pistol caliber. Modern self-defense loadings turns the .380 into a viable self defense round. Some experts say its stopping power is pretty much equal with that of a 158-grain .38 Special lead round-nose cartridge. It is not as lethal as a 9mm but with modern ammo, a lot of people carry it as their main concealed carry weapon. It fits in a pocket, is quick to bring into action and strikes a bigger blow than a .22 or .32. That’s why its popularity has been rising for several years. I am one of those wacky reloaders who actually reload the .380. With factory ammo costing as much as it does, it makes sense to “roll your own” where this caliber is concerned. I usually use one of two bullet weights and styles – a 95-grain cast round nose or a 105-grain cast truncated cone flat point. I will eventually find a bullet mold and cast my own so I can powder coat them but until I do, these commercially-cast bullets work well. A piece of unsolicited advice: the .380 is not an easy caliber to shoot well, due to the small grip frame and wart-like sights that most pocket pistols have. There are exceptions, of course – see my article on the best .380 handguns if you are interested. It is also not a gun I would hand a brand-new shooter unless that gun was the size of a 9mm or so. Tiny guns require more practice, not less. This Load: The load described here uses the typical, representative bullet weight for the .380 which is 95 grains. There are lighter loadings, some as light as 60 grains and also heavier ones but the advantage of using this type of self defense loading with a 95-grain bullet is that you can buy bulk 95-grain FMJ ammo to practice with. That is a good plan – practicing with the same bullet weight you carry. The .38 Special was designed in 1898 to be a more powerful round than the .38 Long Colt. The Long Colt round was ineffective during the Philippine Insurrection, so something better was needed. This led to the .38 Special. Police forces started adopting it until it became the de facto “official” police cartridge. During the late 1920s, the Western Cartridge Company brought out a 200-grain lead round-nosed .38 Special cartridge called the .38 Super Police. Eventually, other loads came out and many police forces adopted the .38 Special. It reigned supreme for a few years until the .357 magnum, and later the 9mm, took its spot as the top dog law enforcement cartridge. It is one of the most versatile handgun cartridges out there. Reloaders love it; you can put together loads that are great for punching holes in targets with full wadcutter bullets or drop a different powder in and load jacketed hollow points for self defense. The standard bullet weight of 158 grains has been eclipsed a little by lighter bullets that can be driven faster. In this day and age of polymer “plastic wonder” pistols (as some shooters call them), it’s important to remember that plenty of snub nosed revolvers are carried daily, and most of them are chambered in .38 Special. It’s been around since the 19th century but shows no signs of fading away. In fact, with modern bullet technology, it’s more popular than ever. 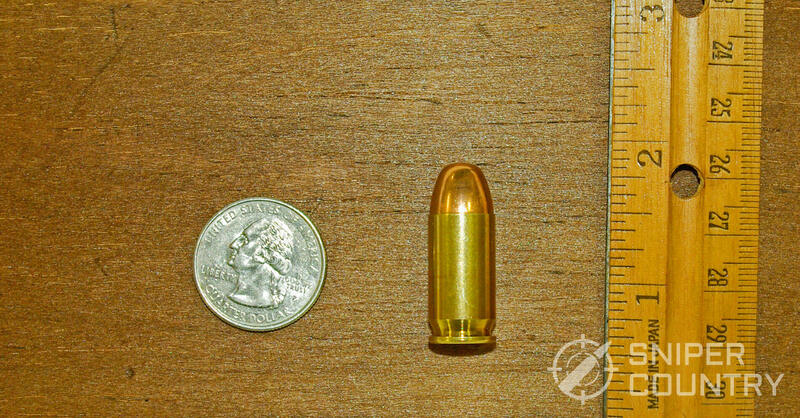 This Load: The load described here is not the typical, nominal .38 Special bullet weight of 158 grains but instead one that uses a 130-grain FMJ bullet. To be sure, there are as many .38 Special loads out there as there are different guns to shoot them in but unless you are using a six-inch barrel you will not get the velocity you are expecting. The 125- to 130-grain class of bullet weight is a good place to start. The .357 Magnum was developed in 1934 and released the next year as “the most powerful handgun cartridge” you could buy. Some shooters, wanting to impress their friends, said that you needed to wear gloves when you shot it due to its vicious recoil. This is a matter of conjecture, not to mention personal taste. I have owned, or do own, .357 revolvers and will testify that it does kick like a mule with the right loads but is by no means uncontrollable. With the advent of more powerful rounds like the .44 Magnum, .460 S&W Magnum, .480 Ruger, .45 Casull etc., the .357 seems downright tame. What really got the .357 going in terms of sales was when Phil Sharpe and others traveled around the world, hunting all types of big game with an 8 ⅜ inch Registered Magnum .357. The heavy-recoiling cartridge was on its way to a reputation it still carries today. Some revolver aficionados call it the ultimate cartridge and reloaders have a field day with it. From deer to larger game where permitted, the .357 is still many handgunners’ go-to cartridge. This Load: The load described here is, perhaps, the most effective .357 round out there for all-around use. It is important to note that many police agencies who issued the .357 used some form of 125-grain loading. There are both heavier and lighter bullets loaded in the .357, but the 125-grain is a great place to start. The 9mm round made its appearance in 1902 in the P-08 Luger pistol, designed by Georg Luger. It has been popular in Europe since its introduction (many small arms that were used in both World Wars were chambered in 9mm). And, according to the 2014 edition of cartridges of the World, it is the most popular caliber worldwide. It came to America in a big way after WWII, when GIs brought back trophy weapons from Germany. Ammunition wasn’t plentiful initially until the ammunition companies realized that the 9 was here to stay and then got into large-scale production. Over 20 years post-WWII, police agencies started using the 9mm. The Illinois State Police were the first state agency to adopt it, along with the S&W Model 39 semiauto pistol in 1967. Then, in 1985 our military adopted the 9mm and the Beretta M9 as a replacement for the classic .45 ACP 1911, many of which were wearing out. By doing so, they also adopted a round that was a Nato standard. When the F.B.I adopted the round, law enforcement agencies followed suite. Likewise, when police agencies adopted it, civilian concealed-carriers saw that as a stamp of approval and began buying 9mm guns. With the huge array of ammo of all types, the 9mm’s future seems secure. When you factor magazine size into the equation with some magazines holding 19 rounds, it is pretty easy to have the equivalent of a full box of 50 rounds on your person if you carry two spare magazines. That is another reason for the 9mm’s popularity. With our military using the 9mm and it being an official NATO cartridge, there is no shortage of surplus or bulk ammo. There are some pretty good deals out there if you are willing to buy at least 1,000 rounds and pay shipping to your door. This is another plus of shooting a cartridge that is popular worldwide. With its relative lack of recoil and reasonable cost, the 9mm is the sweet spot for a lot of shooters. This Load: The load described here is the 115-grain JHP, not the 124-grain or the 147-grain. Any of these bullet weights will work; I had to pick something that is readily available. Please do not think that this 115-grain load is the “best” – it’s just representative of what’s out there. For example, the F.B.I. is using Winchester’s PDX-1 147-grain load. The great thing about the 9mm is that there ARE so many different loads to try. Here is a really good one to start with, easy in the recoil department and fast to get back on target. For more on the 9mm, read my articles highlighting the best 9mm ammo and pistols for it. The .40 S&W (Smith and Wesson) has a rather colorful history. Originally, it was designed to mimic the F.B.I.’s reduced-velocity 10mm load. After deciding that the 10mm, in its original form, was too much for agents to handle, the F.B.I. had it brought out in a reduced loading. Smith and Wesson and Winchester worked on an original cartridge, loaded to that velocity level, that was easier on agents and could be shot in 9mm-sized pistols. Shortening the case to .850 and downloading the 10mm to lower pressures yielded what became the .40 S&W. Even though both the .40 S&W and the 10mm use a .401 in. diameter bullet, there the similarity ends. The two rounds tend to remind me of the difference between the .38/.44 Specials and their magnum counterparts. The .40 S&W is a lower-pressure round designed to be easier shoot, as noted above but it can still be snappy in a lighter pistol. It tends to be loaded to one of two pressure levels (both within its limitations, of course) – a slightly downloaded version and a full-bore cartridge loaded close to the .40’s peak pressure of 35,000 p.s.i. The former makes a good target round, while most self-defense rounds are loaded to the latter’s pressure level. The industry does this, in my opinion, to make the .40 more palatable to a broader range of shooters. Some folks only want so much recoil and blast and are happy with the lower-pressure round while others want or need the full-tilt, big-ball-of-flame-out-the-muzzle hand thumpers. Either way, the .40 S&W is a viable self defense load. It is legal for deer in my state, out of at least a four-inch barrel. More than one respected gunwriter has, for the past couple of years, written pieces about the “death” of the .40 S&W. One major manufacturer, who released a new pistol in 9mm and then in .45ACP was asked if they were going to make it in .40, to which he replied “no” … this would make one wonder about the .40’s future. I believe the reason for the decline (if you could call it that) of the .40 is that 9mm bullets have gotten better, and that the old .45 has made yet again another comeback in popularity. I don’t see the round disappearing from dealer’s shelves anytime soon, but when law enforcement agencies (including the F.B.I.) back away from it to go to the 9mm, maybe there is something to it. The F.B.I. adopted the .40 S&W in 1997 and used it until they switched to their specialized Glock 19 9mm in 2016. Agencies still use the .40, but its usage is down from its salad days. Whatever your position on it, the .40 S&W is still around, available and effective. This Load: The load described here is the typical bullet weight for the .40 S&W, with the 150-or-so grain bullet a close second. This load is available in most stores that sell ammo and is a good all-around load. “Katy, bar the door!” Ka-BOOM! That’s the common perception of the 10mm. The lengthened .40 is one of the more popular cartridges out there in the field now. Where did it come from? 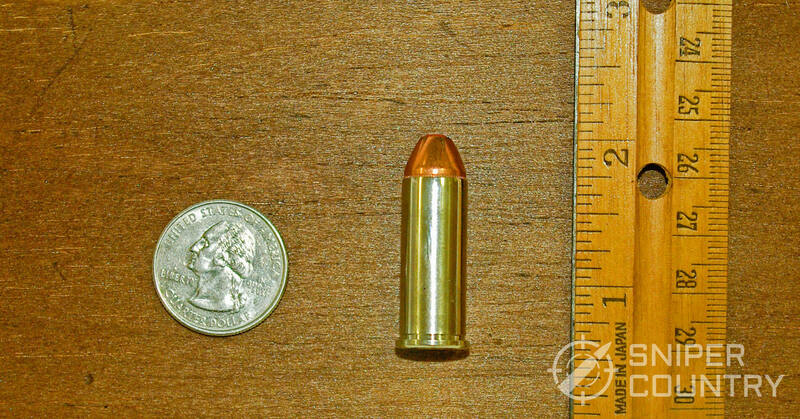 The predecessor of the 10mm cartridge was developed by, among others, Jeff Cooper, Thomas Dornhaus and Michael Dixon and was called the .40 Super. Dixon and Dornhaus produced a pistol modeled after the CZ-75 and called the Bren Ten. The pair went bankrupt in 1986, but Norma of Sweden kept the cartridge in production. The round was adopted by the F.B.I. in 1989 but proved to be too hard for agents to handle with its very stout recoil. After downloading it, the agency adopted a shorter version which developed into the .40 S&W. The 10mm is potent deer and hog medicine out to 75 yards or more (in capable hands). Deer-legal in many states, the hotter loadings are the way to go if you are wanting to fill your tag. Some handgun hunters liken it to the .41 Magnum in terms of velocity and energy, but I’m not sure if that would be correct. I think that the 10mm falls between the .357 and .41 Magnums in terms of energy. Certainly, the round produces energy equal to or greater than many .357 Magnum loadings, often with a heavier bullet. A five-inch-barreled semiauto on your hip with a dozen or so rounds in the magazine is comforting when you’re in the woods. The 10mm is produced, like the .40 S&W, in a couple of generalized loadings. There are the lighter loads meant for practice or for a smaller, lighter gun and then there are the fire-belchers useful for hunting. Should You Use The 10mm For Self Defense? In terms of self defense, a pistol chambered in 10mm is normally carried with the lighter loads as these are usually stout enough for carry without being overly powerful. Recovery time after the shot is affected by how much recoil is generated, so the lighter loadings will allow faster follow-up shots in most cases. There are those self defense experts who think the 10mm is too much for concealed carry, at least in its full-bore loadings. They are concerned about over-penetration causing what is euphemistically known as collateral damage (read: innocent bystanders catching a bullet that went completely through the bad guy) and inability to get the front sight back on target after a shot due to the stout recoil. As with anything remotely related to guns and shooting, there are always exceptions… one size (or opinion) definitely does not fit all. Having said that, the 10mm cartridge is definitely worth a look if you are wanting a multi-purpose round that you can use at the range, carry, or hunt big game with. Its star is rising, as it is more popular now than pretty much any time since its introduction. You may want to check it out. This Load: The load described here is the 180-grain loading at “real” 10mm velocity. There are subloadings that are easier on the gun and the shooter but if you are wanting the true 10mm experience, give this or similar loads a try. Elmer Keith, the father of the .44 Magnum, was the .44 Special’s biggest cheerleader back in “the day.” He probably blew up more guns in his experiments with heavy loads then I will ever own. To this day, the .44 Special is still a popular cartridge with a large following. It is also a reloader’s dream. So, where did it come from? Early in the 20th century, Smith and Wesson produced revolvers for Russia. They were chambered in, appropriately enough, .44 Russian. The .44 caliber was very popular at that time, with several lesser-known variants in circulation but the Russian was very popular. With the switchover from black to smokeless powder, the .44 Russian just didn’t quite cut it in the velocity department so Smith and Wesson lengthened the .44 Russian case .19 inch and called it the .44 Special. Unfortunately, they didn’t capitalize on the ballistic advantages smokeless powder in a longer case provided as they kept the .44 Russian’s ballistics of a 246-grain lead bullet at 755 fps. This is where Elmer Keith and others come in. He, along with the rest of the “.44 Associates”, began experimenting with heavier loadings in the .44 Special. They wanted to take advantage of the round’s full potential so they developed some pretty hefty .44 loads. It got to the point where Elmer wanted to introduce a new .44 Special offshoot he called the “.44 Special Magnum.” Smith and Wesson didn’t like the possibility that one of those mini-bombs might be loaded into an older, blackpowder-framed sixgun so they lengthened the case by .128 inch to prevent the round chambering in a .44 Special revolver. They called it the .44 Remington Magnum, giving Remington credit for its part in developing the ammunition. We will look at the .44 Magnum below. The .44 Special is a very useful cartridge in its own right. Since day one, it has been renowned as an accurate target round. Adjust the powder type and amount and add a hard-cast 250 grain semi-wadcutter bullet and you have an excellent hunting round. Elmer and his buddies took all types of game, both big and small, with the .44 Special in its heftier incarnation. As a reloader, I have shot many .44 Special reloads in guns ranging from my Charter Arms Bulldog snubby up to my 8 ⅜” Smith and Wesson 629 .44 Magnum, always with pretty much the same result: holes in the target close together. I even used one .44 Special load from Georgia Arms, a 240-grain JHP, to kill a deer at a measured 104 yards with my 629. That’s pushing it, I know, for an iron-sighted revolver (I didn’t have a rangefinder) but it put the doe down for the count. Again, this was not a magnum load – the headstamp on the factory-fresh case said “44 Spl.” This was the only deer killed by me with that gun where I used a factory load, not a cast-bullet reload from my reloading bench. The point is – don’t sell the .44 Special short. There are many times I’ve hunted with a .44 with ammo that didn’t say “Magnum” anywhere on the cartridge case. With modern defensive ammo, the old .44 is right at home in a concealed carry revolver or on a nightstand. Drop some hunting ammo in the cylinder and you have a very handy close-range deer gun. Try it – you will most likely be surprised at the results! 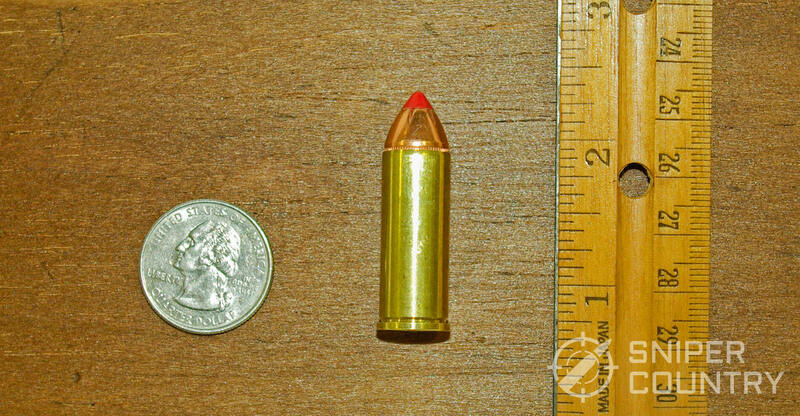 This Load: The load described here is a 200-grain JHP bullet load, not the standard 246-grain. I chose this load as opposed to the ages-old .44 Special loading of a 246-grain lead bullet at (optimistically) 750 fps. Notice the nickel-plated case and the modern Hornady expanding bullet. The load here will be more fun to shoot and can double as a hunting or self defense round, within reason. I mentioned Elmer Keith above and his efforts that resulted in this cartridge. He had a hand in developing all of the “big three” magnums – the .357, .41 and .44. He is probably best known (or revered, by some) for his work that culminated in the .44 Magnum. As mentioned above, he was trying to develop a heavy .44 cartridge for hunting purposes. Along with Remington and Smith and Wesson, Elmer helped develop what we now call the .44 Magnum (technically, the .44 Remington Magnum as stated above). The first revolver chambered to fire the .44 Magnum cartridge was the S&W Model 29 with the prototype seeing the light of day in December, 1955. It was publicly introduced in January of 1956 at a MSRP of $140. Bill Ruger got into the act later that year, bringing out the .44 Blackhawk (soon to be the Super Blackhawk) that summer. .44 Magnum guns are somewhat specialized, popular with handgun hunters. Another bonus for hunters was (and is) the availability of handy carbines chambered in .44 Magnum, either lever actions or semiautos. (Ruger had made a semiauto carbine for the .44 that is out of production but which you still might be able to find on the used market). Having two guns that shoot the same cartridge is a plus, as many in the 19th century American West found out with the .44-40 cartridge. What boosted the .44 Magnum into the mainstream revolver shooter’s orbit was the use of a six-inch Model 29 in the movie “Dirty Harry” in 1971. After this movie was released, Smith and Wesson couldn’t produce the guns fast enough. If you were able to even find one, chances are you would pay well over MSRP for it, as supply could not catch up with demand for many months. As with most fads, production finally caught up and the guns were more available. Shooting the heavy .44 Magnum loads of that time caused different reactions by those who had bought the Model 29 or the Blackhawk. For some of them, the cartridge was exactly what they wanted for hunting, and so they really liked it for that purpose. Others…well, not so much. After supply caught up with demand and many shooters bought the big .44, it was not unusual to see the gun in the used gun counter at the gun shop complete with a box of .44 Magnum ammo with exactly six empty, primer-dented cartridge cases and 44 loaded rounds in the box. One cylinder full convinced the shooter that maybe the gun was a bit much for them. This was before companies started to roll out mid-range loads that were basically like a .44 Special on steroids but nothing like the snorters that belched a two-foot-stream of fire from the muzzle when fired. I remember those days well. I have owned three .44 Magnums – a 7 ½ inch Super Blackhawk, a 6 inch Model 29 (just like Dirty Harry’s!) and my current gun, an 8 ⅜ inch Model 629. I had started reloading by the time I owned the Super Blackhawk, around 1979 or so. I loaded Elmer Keith’s own load, which involved 2400 powder and a 250-grain hardcast semi-wadcutter. I won’t mention how much 2400 was involved. Suffice it to say that, as I practiced for a silhouette shoot, I raised a bone in the wrist of my shooting hand from the stout recoil that the Super Blackhawk generated. So, I backed off a touch and was happier with the results. I traded that gun for the Model 29 (still in demand after the Dirty Harry movies). They were both fine revolvers. I was given my 629 by a dear family friend who had stomach cancer and wanted me to have it because he knew I’d use it, keep it, and would remember him by it. I do not know how many deer that 37-year-old, long-barreled, satin stainless steel gun has taken…many, to be sure. Most have fallen to my mostly mid-range cast bullet handloads with the one exception noted above in the .44 Special section. I will be carrying it on my hip this deer season when I sit in my close blind, with my .243 reserved for the bean-field-distances when I hunt across the road. If you are looking for an all-around revolver cartridge, give the .44 Magnum a look. You basically get two guns in one – just as the .357 Magnum can shoot the .38 Special, so the .44 Magnum can shoot the .44 Special. You can’t ask for more versatility than that. This Load: The load described here is the standard-bullet-weight 240 grain JHP load that is available at most any store that sells ammo. There are many variations on this load as with any cartridge but this one will get most jobs done that you need a .44 Magnum to do. “Old Slabsides.” “Colt .45”. “The Warhorse.” I am describing the legendary Model 1911 pistol, of course, that made its reputation by firing the .45 ACP cartridge. The cartridge today is chambered in many different pistols, not just the 1911. With the availability of guns that will hold fifteen .45 ACP rounds in their magazine (I can think of two at this writing), John Browning’s brainchild is alive and well. The .45 ACP is probably more popular now than it has been for over a half-century. What with the profusion of double-stack polymer pistols (not to mention the many 1911s out there) there is no dearth of platforms from which to launch it. I am soon to assume ownership of a brand-new Springfield Armory XD(M) 3.8 in .45 ACP…as stated, the round is far from defunct. The .45 ACP is very easy to reload, whether you are putting target loads together that barely cycle the action to self defense loads that penetrate a good ways into ballistic gel. The round is especially popular among cast bullet shooters. Another way to fire the rimless .45 ACP round is in the cylinder of a Ruger Blackhawk. I have a .45 Colt model that came with an extra .45 ACP cylinder. The headspace rim is cut for the shorter ACP case and functions beautifully, with the extractor rod having no trouble punching out the empties. Here is another example of a cartridge that is able to be fired in more than one type of gun, adding to its value. I had mentioned above my experience at a silhouette shoot with my .44 Magnum shooting my 250-grain cast semi-wadcutter bullets at around 1300 fps. I had a friend there who shot the first two levels (50 and 100 yards) with a stock 1911 and factory 230-grain ball ammo. When I connected with a target, it sounded like “bang-clang-drop”. When Lynn connected with his semiauto firing the old punkin ball, it sounded more like “bang…………clang……………..drop” as the slow-moving bullet hit the steel target eventually. It then took a second or so for the target to decide if it would fall over. The disparity of energy released between the two rounds was enormous, but the point is that even the lowly .45 ACP still had enough energy and momentum at those two ranges to take a fairly heavy steel target down. If you are one of those shooters who won’t carry a concealed weapon unless its caliber starts with “4”, then the .45 ACP is a natural for you. The rest of us might take a long look at it, as well. You can’t argue with 107 years of success. This Load: The load described here is the standard 230-grain “ball” load. This is available anywhere and is a great general-purpose load. Self defense loads are available, as are many others but this is “the” standard .45 ACP load. Many purchasers of new .45 ACP guns use it to “break in” their weapons – it works very well at accomplishing that purpose. From the Army’s Single Action Army revolver of 1873 to the modern single- and double-action revolvers chambered for it, the .45 Colt is one potent cartridge. Its 255-grain bullet in its initial blackpowder loading was quite a manstopper, not to mention being able to drop the horse the adversary was riding. Developed to give the military a more powerful, effective cartridge than what they were using at the time, the .45 Colt has survived and thrived to this day. The .45 Colt has a long and storied history. As mentioned, it appeared in 1873 in a blackpowder load that sent a 255-grain round-nose flat-point bullet downrange at 900 fps. Colt developed its 7 ½ inch barreled Single Action Army (SAA) revolver to fire the new cartridge. This gun was the magnum of its day and continued in that role until well into the 20th century when more powerful cartridges eclipsed it. The round has been in continuous production to the best of my knowledge since its introduction and is, if anything, even more popular today. With the number of revolvers built to chamber it growing, its future is secure. Not bad for a 145-year-old cartridge! One factor that had not allowed the .45 Colt to be loaded to its full potential was the fact that ammo companies continued to load it to its old 19-century pressure levels. The concern was that a higher-pressure loading might be fired in a blackpowder-era revolver and blow it up. It wasn’t until fairly recently (in relative terms) that companies began bringing out .45 Colt loads that used modern jacketed bullets at speeds above the old loads because manufacturers started introducing newer, stronger revolvers. Handloaders have dealt with this issue for years. My Lee Cast Bullet Reloading Manual shows .45 Colt loads in two sections: standard-pressure for older revolvers such as the Colt SAA and clones. Ruger-only (or other single action made to withstand the higher pressures) loads are in their own section. The Ruger loads, in some cases, nip at the heels of the .44 Magnum or in some cases surpass it in terms of velocity. The slightly larger .45 Colt case will allow higher velocities with a slightly slower pressure curve than will the smaller .44 Magnum case that peaks faster due to its size and volume. Two hunting seasons ago, I shot a doe with my .45 Colt 5.5-inch Ruger Blackhawk revolver at a distance of around 75 yards. 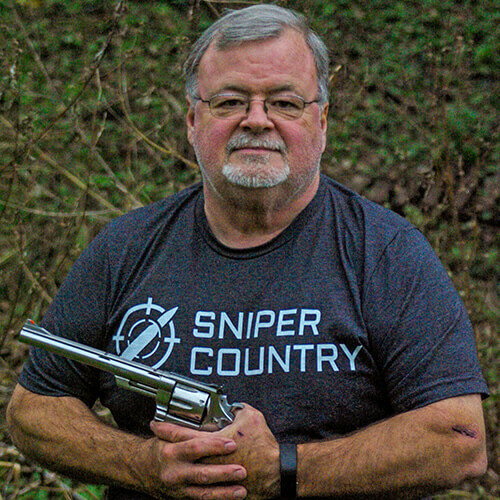 I was using a Ruger-only load with my hard-cast 255-grain bullet that pretty much duplicates the original bullet introduced in 1873 but cast much harder. The deer went down quickly. I also owned a Rossi lever-action carbine, a copy of the Winchester 1892 model, in .45 Colt. I had killed deer with that, as has my friend to whom I had given it. (Side note: the .45 Colt was not chambered in carbines or rifles in the 19th century. That honor fell to, among others, the .44-40. It is only fairly recently that lever actions are made in .45 Colt). There’s just something about a big, flat-nosed heavy bullet moving at 1000 fps that ends the argument about handgun cartridge effectiveness on deer. If you are looking for .44 Magnum-range ballistics but want a revolver with a little more history behind it, get a new .45 Colt. Just make sure it’s one of the newer Ruger or BFR-type guns made to handle the pressures. As with several of the revolver rounds discussed here, you would have in essence two guns in one – a nice, easy-shooting piece when loaded with standard velocity ammo, or a full-blown rip-snorter when loaded to its full potential with muzzle energies of over 1,000 ft.-lbs. I shoot both loads through mine – it’s a lot fun. Give the old cowboy load a try! 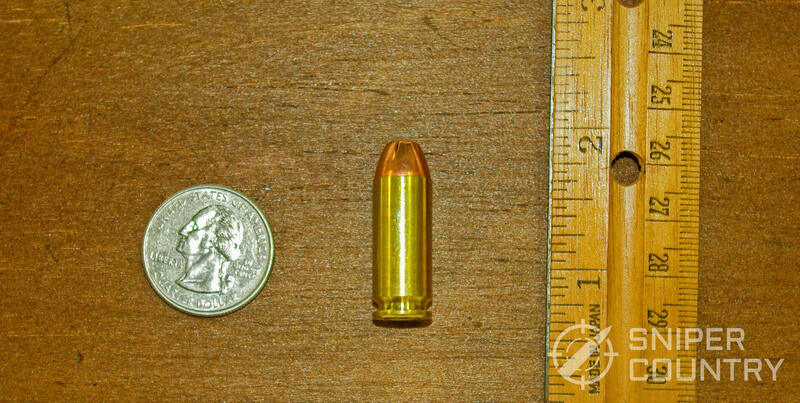 This Load: The load described here a modern, ballistic-tipped-bullet version of the .45 Colt that would suffice for self defense or hunting. The old, standard 255-grain lead bullet at around 900 fps was a decent fight-stopper but tended to lead barrels. This fairly new version, a Hornady LEVERevolution, was designed to use in lever action carbines as well as handguns. Either way, you can’t go wrong. Now that we’re at least familiar with the major handgun cartridges, you might wonder just which one you want to select as you look at handguns to buy. In terms of rimfires, it is assumed that if you own one or more .22s you are familiar with all the different rimfire ammo out there. If you are not a reloader and like revolvers, the .357 Magnum makes a great choice as you can shoot cheaper .38 Specials through it. The .44s follow the same plan except that ammo is a little more expensive. Likewise, if you are not a reloader and like semiautos, the 9mm is by far the most popular round out there and the most available/affordable. If you are going to be reloading or already do, any of the rounds mentioned would work. Some are easier than others, as is pointed out above. Hunting medium to big game with a handgun requires skill, practice and a gun designed for the job… .357/.44 Magnum, 10mm, hot-loaded .45 Colt, etc. (Note To Hunters: Do not try to prove anything by going after deer with .38-Special-pressure-level ammo in any caliber. It is probably illegal and will result in a wounded animal in most cases. Stick with ammo designed for that job). Do not be afraid to try something new. If you’ve wanted, say, a 10mm for a while and can afford one, go for it! You can buy downloaded ammo until you’re ready for the heavy-duty stuff. Now’s a great time to get a new gun. Mostly, have fun as you work your way through the cartridge list. Shooting is supposed to be fun. Remember your eye and ear protection and be safe! Please feel free to leave questions or comments below. I will answer questions as soon as I can. Thanks for the kind words, and thanks for your service. The 10mm IS awesome and very versatile. As for the overpenetration, I wasn’t thinking LE so much as an over-the-top civilian commando-type who has to carry the most powerful gun out there…I’m sure you know the type!. Thanks for a very interesting reply! It’s a pity that one of the better calibers is forgotten, the .38 Super which is one of the favorites in IPSC shooting. Yeah, the .38 Super is one great round, but we had to draw the line somewhere. I did mention the .38 Super in another article I wrote on 9mm 1911s – it is still going strong after its introduction in 1929! Nice informative article. Good writing.